Overall: Sake is a very tall and slender man, he has very light skin and light red hair in a mohawk style that manages to stand up on it's own. He wears a golden headband that wraps around the back side of his cranium, it sets above his large pointy ears (a natural feature of the native race) that help give his face a great definition. Beneath all his clothing Sake wears a greenish brown tight jumpsuit that covers his feet up to his neck and wrists, it sets against his body enough to reveal his muscle build without restricting his movement. On top of his jumpsuit he wears a long tailed orange tunic that has pointed shoulders, this attire is a minor deviation from the other members of his race's clothing design. Around his neck he wears a long blue scarf that hangs both in front of his torso and down his back, the front half his held beneath a belt that is latched over his tunic holding the clothing together. His wrists and shins are covered by a yellow sleeve, which are covered by brown gloves and boots. His boots are covered with reinforced gold metal creating a unique design, the metal matches his belts buckle and his headband. Overall: As a Shin-Jin born from a golden apple, Sake was created with a positive alignment. This makes him see the good in everything he can, the only thing he finds difficult to see as necessary is killing of innocence. He is very calm and a very hard man to aggrivate in any circumstance whether fighting or just conversing with others, Sake treats everyone with the respect they deserve. His personality changed when his younger over-confident self caused him to loose his home in Haven, his teacher Shinki stripped the purity from his heart (dropping his alignment) allowing the planet to banish him to Earth. This action turned him into the calm and observant Shin-Jin he is now, he never allows his self to be overtaken by emotions remaining mostly happy or unattached to the people around him. History: Like all members of the Shin-Jin race Sake was once merely an apple on the Kaiju tree, when he reached his "ripe" stage the apple exploded and from it fell little Sake. 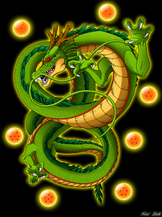 Unlike most the apples on the tree Sake's was gold meaning he was a candidate for the Supreme Kai stature, this meant he was born Lawful Good at heart and was made the apprentice of Shinki the Supreme Kai for the last ten thousand years. As Sake grew older he began showing a more and more self centered attitude concerned only with his own "greatness" or so he thought was greatness, Shinki spent years trying to teach him other important things to change his ways. After spending 50 years on Haven Sake approached Shinki with doubt in his mind proclaiming Shinki never intended to make him the next Supreme Kai, to this reaction Shinki told Sake of his disappointment and said he should earn amongst the people from the universe what the meaning of a Supreme Kai is and then stripped away his purity banishing him from Haven. Since that day Sake has been on planet Earth where he has strived to bring his self back to Haven and make peace with Shinki for his wrong doing, it has been 50 years since his abandonment on Earth and he waits for his chance to redeem his self. » WELCOME TO THE SAKE PARTY 2013...After a time loop.